As you'll recall, I recently added a pantry to our dining area (the closest area to the kitchen) and I wanted it to look better than your average boring pantry or closet. The opening is 81 inches wide so instead of doing 2 huge closet doors, I opted for three smaller standard doors that I picked up from a local building materials recycling company. I also wanted all three doors to roll to one side or the other so I could get to the maximum sized opening possible when I need to access the food inside. The easy part of the project was attaching the two back doors which are each 28 inches wide. I used a standard closet track system and followed the instructions in the box. I did buy a nice one knowing it would be used many times daily but it was available at my local Home Depot so this should be easy for you to acquire. Let's start with just the track setup. My track is 96 inches long, I wanted it to run wider than the actual opening of the pantry. 2 pieces of 4 feet by 1 1/2 inch by 1/4 inch steel (Lowe's or Home Depot). NOTE, this must be 1/4 inch if you're going to use the same garage door pulley I'm recommending. Of course, if you can get an 8 foot long piece that's 1 1/2 inch by 1/4 inch thick, go for that instead. First, I stained an 8 foot long piece of 1x4 hemlock to match other wood in our house. I hung that up using matching screws secured into the studs. I positioned those screws so that they would be hidden by the steel track later but was mindful to avoid where the bolts would need to go. The front edge hangs 1 1/4 inches down from the finished opening to the pantry. This was low enough to hide the metal track but high enough so I could still remove the back doors for repairs if necessary. Next came the actual steel track. It consists of two pieces of steel that I purchased at Lowe's that I spray painted flat black. Each piece is 48 inches long, 1 1/2 wide and 1/4 inch deep. I used my regular cordless drill and a good bit to drill three holes in each piece; 4 inches from either end and in the center. Using lots of clamps, I positioned the steel bars one at a time, end-to-end and marked where I would need to pre-drill through the wood. I positioned the bar 1/2 inch down from the top. I liked the way this looked and it allowed ample clearance for the bolt that will go through the center of the wheel. I took the steel back down and drilled 1/4 inch holes through the wood and into the studs (where I hit them). 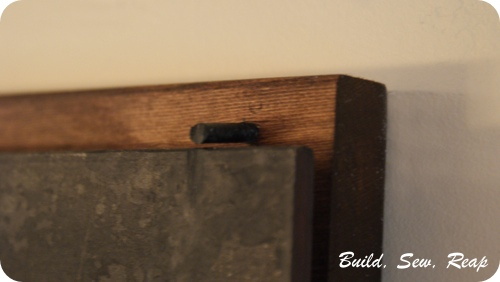 Since I screwed the wood into the studs in an earlier step, it isn't as necessary that the steel be attached to the studs, as long as it is securely attached to the stained wood piece. The goal here is to have the center of the track as close to 3/8 from the wood as possible. 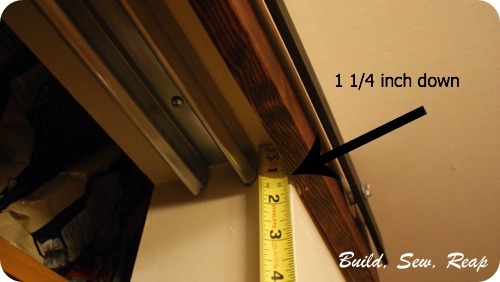 This was what I determined would make my 1 3/8 inch thick hollow-core door hang straight and glide easily without hitting the other doors. I did a little bit of experimenting with this so if you're using the same materials I'm using, save yourself the balancing act. I found that I needed to get each one started just a little bit before I could tighten them all down. Remember also that you will have a little bit of wiggle room as you're tightening so take care to ensure your two tracks are perfectly aligned and butted up tightly against one another. I tapped mine with a hammer before fully tightening down all the screws and my doors glide easily over the intersection. The last step is to create door stops. I wanted something really subtle so I used a nail that I tapped in until I felt like it was really secure and then I used a hack saw to cut the nail off and I painted it black to blend. If anyone gets up a bunch of speed with the door, it will fly off the end most likely but I felt like it was secure enough in our household. 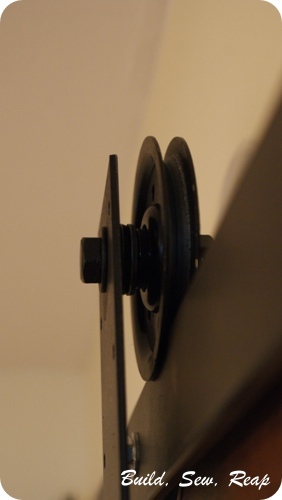 If you don't feel like this would work in your home, perhaps try using an L bracket to stop the wheel. I purchased one 36 inch long by 2 inch wide steel flat bar because I liked where the existing holes were positioned. If you can't find that, you can drill your own holes. The top hole should be an inch from the top of the bar to achieve the same look I have. The goal on this one was to set the center of the wheel 5/8 inch away from the flat bar. 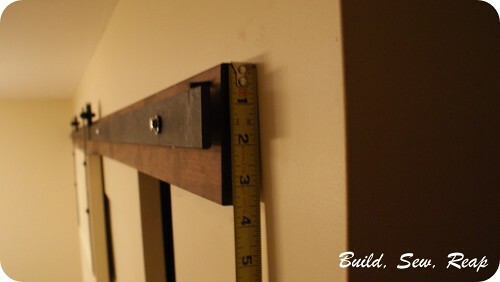 Next, I used clamps to position the bars on the door while in place. I checked to ensure it rolled smoothly from end-to-end, appropriate gap under the door (matched the other doors) and that it looked good from afar. Once I liked where it was, I marked the placement very carefully, took the door off the track, and removed the clamps. Then I glued the bars to the door as marked and clamped them back down. 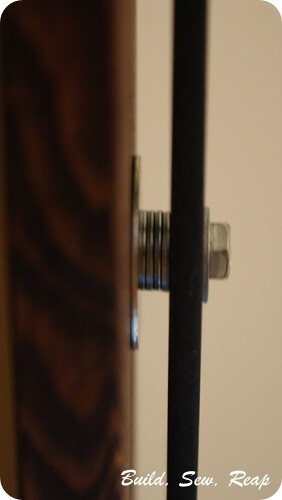 Finally, I pre-drilled and screwed the 1 inch lag screws with washers into the door. The lower two didn't make a great connection but they went through glue so while they aren't highly functional, they are stuck in there for good. I allowed the adhesive to dry per the instructions on the container then removed the clamps and hung the door. 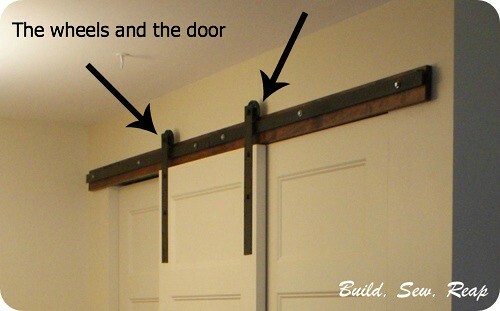 HINT: If you find that you didn't get the bars glued into place exactly right and need to adjust how the door hangs, try loosening up the bolt through the pulley and adjust from up there. There is a little bit of wiggle room there. 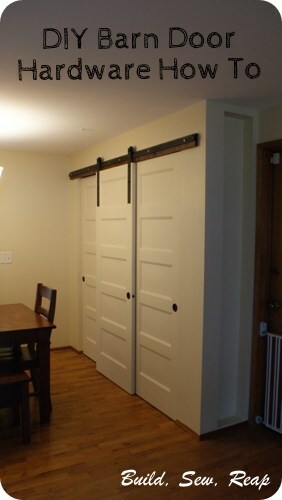 Now stand back and enjoy how awesome your new barn door looks! I love how this looks Julie! Might I bring you coffee one of these days and see it in person? It's been too long! This is a brilliant idea! Especially since my kids are always so rough on their hinged closet doors. This seems like a more viable solution...love it! He's more of a big nugget these days but YES! Absolutely brilliant!!! And what a great tutorial, thank you so much for your time and effort (must have taken you nearly as long as building the whole thing)! I'm going to print this out and take it to all the stores until we've found everything we need! We nearly gave up on the whole idea, so thanks again for all the details and pictures! Really appreciate it!!! This is truly amazing! Love your instructions--I'm sending them off to a friend! Hi Mia - can I ask how it went? Please let me know if I left out anything important or if I can improve my instructions. It was so much information and, of course, I didn't get from point A to C via B, I pretty much explored every option and had a lot of fails along the way so I had to reconstruct the wins in this post. Feel free to email me directly at julie at buildsewreap dot com too. Thanks Tonia - I'd love to see pictures if you give it a try. I have two VERY rambunctious boys and I haven't sweated them using this once. I'll even go so far as to say I put some of their craft things in the center so they're in and out of the pantry daily. I completely trust the construction. If you do it for kids though, make sure you put really good stops in at either end so they can't get up a bunch of speed and send the door flying off the track. It hasn't happened here and I don't think it will but you wouldn't want to miss that step or try to cut corners on the stop. Hi there! Love this tutorial!! 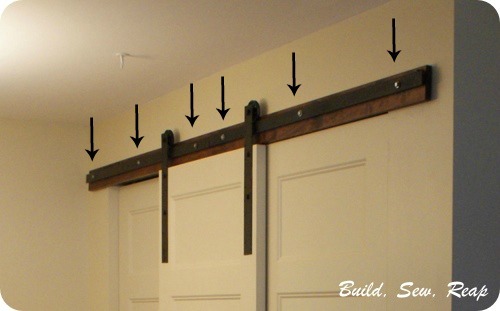 I was wondering how you prevent the doors from swinging/clanking together? 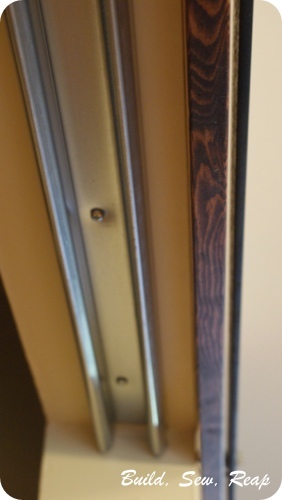 Do you have any sort of guides or rubber stoppers on the back of the doors? Again, love the tutorial! Thanks Michelle!! I hope it's helpful. I'm still so in love with my pantry. It is so much more interesting than the paper piled desk that used to sit over there. That desk is now in a new great space too so we had several layout upgrades as a result of this build. It's so wonderful to have a safe place to store the bounty I preserved from our big garden this year too. This is awesome! Do you think the track could hold two doors or would that be too much weight? 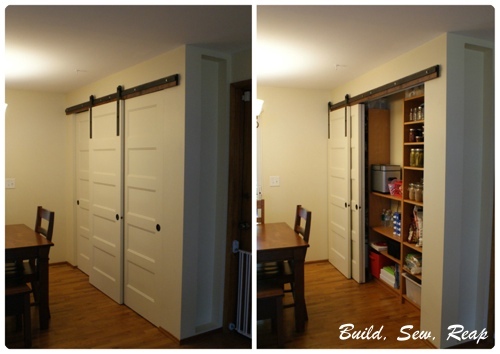 So if you were replacing hinged closet doors and needed something two-doors wide could you put two doors on that track, using 4 pulleys? thanks! Hi, thanks for stopping by! I do think the track would be plenty strong to hold two doors but they won't bypass each other so if you need two doors, I would put one on a regular sliding closet door track just inside the doorway as I did for my 2 inner doors. You want them to be able to slide off to one side or another stacked against one another. Does that make sense? Julie, this looks so great the instructions looks so doable I am very appreciative that you put this together. I have a question, if there is no door behind you were existing barn door do you find that it tilts back on the bottom if it's gently nudged. The reason I ask is because I'd like to use the system using two doors and four pulleys to separate two rooms. My worry is that because there will be nothing behind the doors, it may sway, if it is gently nudged and come off the track system. Have you found this to be any worry? Hi Lexi, thanks for stopping by the blog. The doors do swing a bit but I've never had ours even come close to sliding off the track. Because of the shelves inside, it can only swing about 6 inches that way. I just gave it a good pull the other way and honestly, the door is heavy enough that I doubt very much it would fall off the track. This is not a scientific answer, merely an estimate based on my experience. If you make sure you use the proper number of stacked washers to ensure your door hangs vertically, it should look and function correctly. Perhaps you could look around at the expensive options to see where differences might occur. Are the rollers deeper? Is there a bottom guide? Then use your best judgment to decide if this would work for you. I wish I could offer a definite yes or no. Oh, I have kittens and small boys and none of them have successfully derailed the system although they've sure given it a run for its money. knocked me socks off girl! Love this, am going to put it in my entry. Question. how big is the gap looking from the other direction? It must be somewhat larger as I understabd the two doors 'bypass one another, correct? Please come to California and do this at my house! Amazing! I have been trying to figure out how to turn my closet opening into a triple sliding door and this is perfect and exactly what I was looking for. Thanks you! Hi great tutorial! I have a quick question. Did you install the bottom piece for the closet system? I dont see it in the photos. If you didn't are the doors still sturdy? 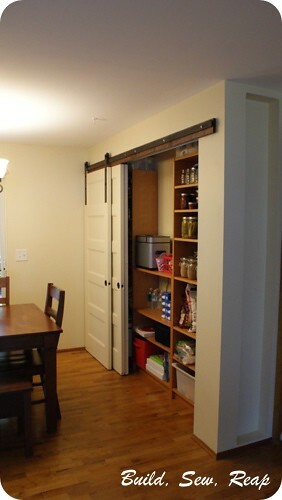 I really like that sliding barn door. And many thanks for the images and installation instructions. These instruction will help me install my door easily. I actually tried something similar to this but completely failed! 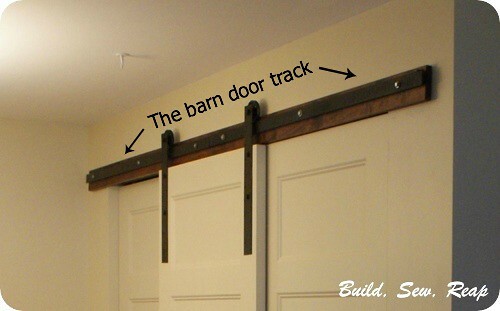 Maybe buying a cheap door track could be it, anyway I think after looking at this I'll give it another go! 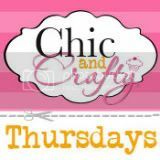 Hi Julie,Such a great idea and something I would love to do also! Great job!